These have a very heady scent. Gorgeous shot! I can smell them even here. Ooh, that's really lovely, and it looks as if it has a heady scent! Is this an old garden plant......how would you grow it? Thanks all. Janey, I planted 6 tuberose bulbs November 2006; the ground squirrels helped themselves to 4 of them before they bloomed. The two that are left keep coming back better and better. I attribute my success with bulbs and tubers to the fact that I don't have to dig them up every year. Other than that they get watered and fed occasionally. its amazing Gardengnome... does it have a smell? What a beautiful flower, one for the the"must have list"
This variety is beautiful ! I have the single bloom version and it's not all that attractive, but still has a wonderful fragrance. Yours is certainly a winner ! 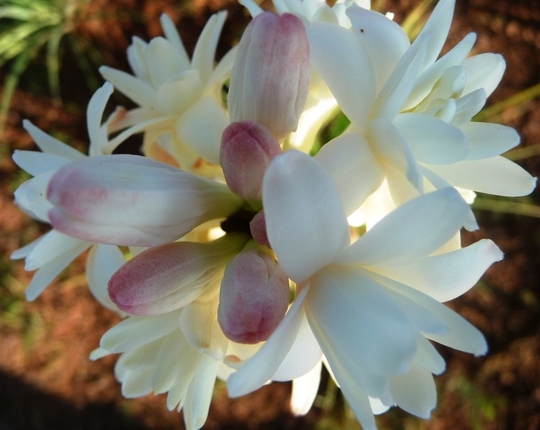 See who else is growing Polianthes tuberosa. See who else has plants in genus Polianthes.